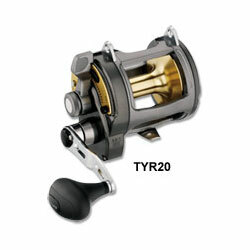 Strength, durability and control are the hallmarks of Shimano's diecast aluminum-framed Tyrnos Reel. Its 4 A-RB stainless steel bearings offer 10 times the corrosion resistance of standard systems, and the graphite side-plates are braced with aluminum for extra strength without added weight. Reduced Profile top crossbar; oversized gears; alternating twin-pawl anti-reverse; bait clicker; ratchet drag. "I would recommend this to everyone that is fishing on the reef. I have caught Dolphin, Sailfish, Kings, Blackfin Tunas and wahoo with this reel. It is very durable and reliable as well and with the 5:1 gear ratio it is awesome to use on the Kite. This is a great choice." "This is a good reel. The bad thing is that it does not hold enough line. We hooked a 500+ pound jewfish and were almost spooled but then the line broke. Other than that, it is good torque for bottom fish."